The author of this article, Mike Freed, is one of the founders of the Valley Soccer Club and has been the organizer for all the club’s trips and hosting events. He is currently the Varsity Girls Coach at Upper Perkiomen High School, to which Valley is the feeder program. Mike was an eight-year Philadelphia Union Season ticket holder (a founder member) and also supports West Ham United, pretty much guaranteeing disappointment from soccer matches on a regular basis, but he continues to cheer both teams on nonetheless. When you think of small community-based soccer clubs, you generally don’t associate them with soccer on a global scale. But for the Valley Soccer Club, based in the upper corner of Montgomery County, playing soccer internationally has been part of its DNA for 25 years. 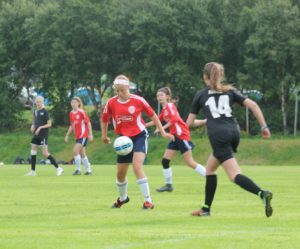 In July, two of the club’s teams traveled to Reykjavik, Iceland, to participate in the Rey Cup, a 100-team youth tournament. The Under-14 Girls (Voodoo) lost their first three matches, rebounding with a pair of wins before falling on PKs in their final match to finish sixth in the tournament’s “A” Flight. The Under-15 Boys (Crew… apologies to Union fans) went 3-3-0 in the Under-16 “B” flight, finishing with a PK shootout victory that saw all seven Valley shooters find the back of the net. The trip marked the fifth different country the club has played soccer in. How does a small club like Valley become global travelers? A little bit of luck, a decent amount of networking and a ton of fundraising all play a role. The Voodoo girls team in action in their first Rey Cup match. Back in 1982 (which was only the club’s third season), a relative was visiting one of the club’s coaches and saw how the Upper Perkiomen Valley was embracing the sport. He took word of the club back to his hometown of Gottingen, in what was then West Germany. A few weeks later, a letter arrived with an interesting proposal: would the club be interested in hosting a team from RSV Geismar the following summer? With little hesitation, Valley extended an invitation. In July of 1983, the German guests arrived with a level of soccer well above the teams in the area, beating five of six teams from member clubs of the Upper Bucks Soccer League with a combined score of 50-6 (the lone loss coming in a thunderstorm-shorted game). With a strong Pennsylvania Dutch speaking population in the community, the Upper Perkiomen Valley was a perfect fit for the Germans to feel right at home. From those two weeks, a friendship was sealed. Just one year later, players from the Valley Soccer Club were off to Germany for the club’s first international trip. Staying with families from RSV Geismar (like the Germans had done during their visit), the players got to experience life as part of a German family. They also showed how much they had grown on the soccer field in a year, going 3-3-0 on their six matches, including a 3-2 loss to the same team that had drubbed them 9-2 the previous summer. For most in the club, it was viewed as a once-in-a-lifetime experience, but it was only the tip of the iceberg. Geismar sides would return to the United States on three more occasions, while Valley would visit Germany five more times in the 80s and 90s. During the 1991 visit, the club played a match in Silberhausen, a town that had formerly been part of East Germany. Their visit marked the first group of foreigners to visit the town in 45 years and was celebrated by over 500 spectators in attendance and a welcome reception afterward. With the club’s membership growing, the leadership felt it was important that its girls’ teams get the same opportunity. In 1989, the club sent their U-16 Girls to England, participating in the Watford Football Festival and Wedgwood Keele Classic. Girls teams returned to England in 1991 and 1993, this time taking the championship at Keele on both trips (the championship awards all made by the famed Wedgwood Potteries) and were runners-up at Watford both times. Trips to England provided a wealth of sightseeing opportunities such as Big Ben, Buckingham Palace, Windsor Castle, Tower of London and Wembley Stadium. The second and third trips also included a couple of days between tournaments in Wales, adding another pin on the map of places visited. The overseas travel scene changed dramatically after 9/11, but that didn’t prevent the club from finding ways to continue to play soccer in other countries. The country just changed to our friends to the north in Canada. The club took a couple of girls’ teams to participate in the National Capital Cup, what was then a high-level all girls’ tournament in Ottawa. During those tourneys, friendships were made with individuals running the Ottawa Internationals Soccer Club, one of the tournament hosts. As a result, Valley and OISC formed a sister club relationship, with OISC teams visiting Pennsylvania for a long weekend in late October most years, and Valley sending teams to Ottawa every other summer. This friendship has been going strong for over a decade and shows no sign of slowing down. On the bus trip home from Ottawa in the summer of 2017, the Valley coaching staff evaluated how well the players had performed and conducted themselves, and concluded that it was time to do something big again. Looking at the field of options, the club decided the Rey Cup was a great fit. A small tournament consisting mostly of mostly Icelandic teams, the Rey Cup also drew teams from the British Isles, Scandinavia, and even unusual places such as Chile and the Faroe Islands. Interesting, there had been hardly any American teams. After eight months of fundraising, 16 girls, 15 boys, 5 coaches, and 16 family members (the traveling supporters section! ), boarded a flight for Iceland on July 24 to add a fifth foreign nation to the club’s history. What was also special was that three of the five coaches had travelled to Europe as players for the club. Carla Sokel, coach of the girls’ team, had played on the club’s first girls’ team to go to England. Her husband Rick, boys’ team assistant, was on the Germany trip that visited Silberhausen in former East Germany, while the boys’ head coach, Jason Gray, was a member of the club’s second team to visit Germany in 1987. It was special to have individuals who had such an opportunity as a youth player be able to give back the same opportunity to their own children and their teammates. The tournament featured an Olympic-style parade of teams and a similar closing ceremony. Teams were all guaranteed six matches from Thursday to Sunday, culminating in finals being played in Iceland’s National Stadium. Matches were shorter than what we are used to in this country (2 x 25 minutes), and a far more physical style of play made both teams need to learn how to adapt. The boys’ team, with a number of players who had a year of high school soccer under their belts as freshmen adapted a bit quicker. Their losses were all by one or two goals, one of which was to the eventual tournament champion. The girls, who have had a pair of very successful seasons in PAGS as well as a Turkey Hill Cup championship as U13’s and reaching the semifinals of the President’s Cup as U14’s, took longer to adapt, but once they did they showed a form that produced a pair of lopsided wins. Unfortunately, their first two matches (both kicking off barely 24 hours after arriving in Iceland) would be against the two finalists, leaving all to wonder if a kinder schedule and a little more sleep could have produced some better results. The club believes that these trips can’t be just about soccer. One of the great features of the tournament was a social event for the players every evening, including a pool party (heated via hot springs), a disco, and a barbecue. This gave the players an opportunity to socialize with players from other countries, which usually produces the realization that despite the language, culture and geography, they share more in common with players from other nations than they have differences. Sightseeing and educational value is highly important, so among the places visited were Viking World (a museum that is home to a re-creation of an 8th century Viking long ship), Hallgrimskirkja (the church that is the city’s tallest landmark) and the Golden Circle Tour (a tour that features a waterfall, hot springs, a geyser and Thingvellir National Park — the Viking Parliament meeting site for 900 years that is situated on the fault line between teutonic plates, filled with fissures and cracks in the ground from centuries of seismic activity). 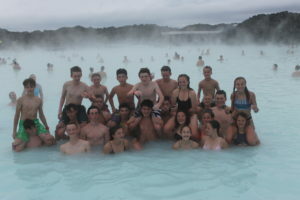 And for many, a highlight was certainly a visit to the Blue Lagoon, a geothermal lake in an old lava field where the 100-degree water contains skin-healing proprieties. 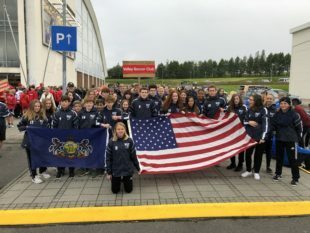 The Valley Soccer Club is proud of its tradition of travel to foreign countries and hopes to continue to offer such opportunities to all their players as they come through the ranks. If you’re a coach or an administrator, consider such a trip for your teams… it’s an experience of a lifetime that will leave lasting memories for your players. What a great tradition! Shows how international soccer is. I played myself on Borneo and in Nigeria and Scotland and my sons played in Hong Kong, Germany and Holland. Thanks for writing about your experiences and posting this!